The Casio XJ-L8300HN is a lamp-free 4K UHD laser projector featuring a brightness of 5,000 ansi lumens. Not only does it offer a low cost of ownership thanks to the 20,000 hour light source lifespan, the 4K projector is designed for continuous use, under a special 5 YEAR MANUFACTURERS WARRANTY on everything. 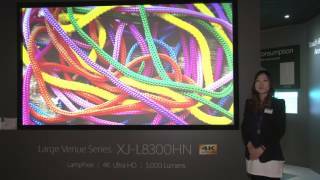 The native 4K DLP® chip enables the XJ-L8300HN to project some 8.3 M pixels and achieve 4K Ultra HD resolution. Offering a low cost of ownership, long lifespan, gorgeous 4k visuals at up to 200" and easy installation the Casio XJ-L8300HN is an ideal projector for Exhibits, venues and seminar rooms, anywhere where the benefits of high brightness and 4K UHD resolution can really be appreciated. Casio XJ-L8300HN is a lamp-free 4K UHD laser projector featuring a brightness of 5,000 lumens and 5 YEAR MANUFACTURERS WARRANTY on everything. The XJ-L8300HN is equipped with a 4K DLP chip supporting an ultra-high-definition resolution of 3840 × 2160 pixels. This offers audiences exceptionally sharp and detailed images with bright and vivid colour reproduction. Installation of a DLP chip enables to deploy advanced image-processing technologies to project some 8.3 M pixels and achieve 4K Ultra HD resolution. The built-in lens shift function auto corrects the visual positioning of the image without reducing the resolution, ensuring the highest possible image quality is projected and gives your venue an easier installation. 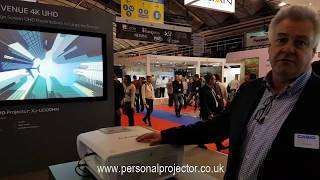 This 4K Laser projector is ideal for halls and seminar rooms, rental & staging market, visitor attractions, command and control environments and CAD design work where the benefits of high brightness and 4K UHD resolution can really be appreciated. A high contrast ratio of black to white is crucial for ensuring a true-to-life picture. This native 4k DLP® projector produce sharp, rich images thanks to an excellent contrast ratio of up to 20,000:1. The laser projectors from CASIO are able to function without the use of toxic mercury and reduce power consumption by up to 40%. Thanks to the use of mercury-free lighting technology, CASIO projectors are able to function for up to 20,000 hours without replacing the lamp. The revolutionary laser and LED hybrid light source guarantees clear and brilliant colour reproduction for all projectors – even in daylight.